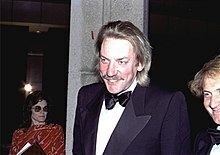 After quitting the London Academy of Music and Dramatic Art (LAMDA), Sutherland spent a year and a half at the Perth Repertory Theatre in Scotland. 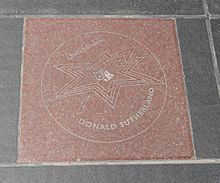 In the early to mid-1960s, Sutherland began to gain small roles in British films and TV (such as a hotel receptionist in The Sentimental Agent episode 'A Very Desirable Plot' ). He featured alongside Christopher Lee in horror films such as Castle of the Living Dead (1964) and Dr. Terror's House of Horrors (1965). He also had a supporting role in the Hammer Films production Die! Die! My Darling! (1965), with Tallulah Bankhead and Stefanie Powers. 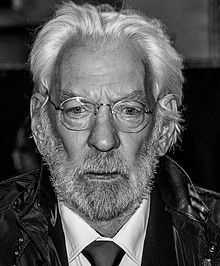 In the same year, he appeared in the Cold War classic The Bedford Incident and appeared in the TV series The Saint, in the 1965 episode "The Happy Suicide", and in the TV series Gideon's Way, in the 1966 episode "The Millionaire's Daughter". In 1966, Sutherland appeared in the BBC TV play Lee Oswald-Assassin, playing a friend of Lee Harvey Oswald, Charles Givens (even though Givens himself was an African-American). 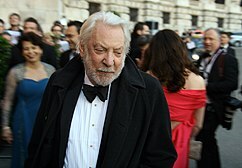 ^ a b c The Observer, 30 March 2008: On the money ��� interview with Donald Sutherland; retrieved 16 June 2012.